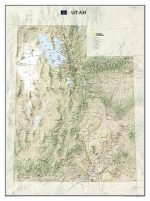 The Grand Canyon, Petrified Forest, Painted Desert, and Monument Valley are all part of the spectacular Colorado Plateau in the north as shown on our Arizona map. 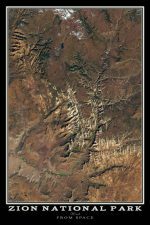 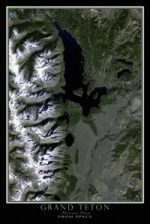 Rugged mountain ranges run along just south of the plateau, and a series of fertile valleys lie between mountain ranges like Santa Catalina, Superstition, Chiricahua, and Gila. 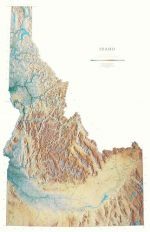 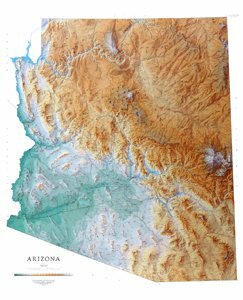 All of our state wall maps display an incredible amount of detail, from cities, highways, and mountain ranges, to valleys, rivers, and small towns.The Arizona map elevations are represented by color, and this, in combination with our relief shading technique, gives the map a lush, 3-dimensional look.